Reminder that this month's Virtual Tasting is Friday October 30th. Read about the wine as well as a list of Washington and on-line retailers here. In tough times, we continue the search for good, inexpensive wines. No stunners this month but reasonably solid wines overall. Charles & Charles is a joint venture between Charles Smith (K Vintners, Charles Smith, Magnificent Wine Co.) and Charles Bieler (Three Thieves/Rebel Wine Co). Red Diamond is one of Ste. Michelle Wine Estates’ holdings. The first vintage from this winery was in 2003. Juan Muñoz Oca has served as winemaker since 2006. Both Red Diamond wines sampled here are stylistically similar. The Merlot seemed to show a fair bit of Syrah (the winery’s website is outdated two vintages and requests for updated information have gone unreturned so don’t know if this is the case). Both are enjoyable, easy drinkers for the price and should be commended for their low alcohol levels. That said, folks who do not enjoy wines with a whole lot of oak flavors should look elsewhere. Two Vines is Columbia Crest’s entry level brand. These wines consistently offer good quality and a low price point. The 2007 Sauvignon Blanc has a lot going for it for the money. I didn’t list it as ‘Recommended’ due to the number of chinks in its armor. In terms of scoring it comes up short but is high in terms of QPR. The last wine is from Charles Smith’s Magnificent Wine Company. 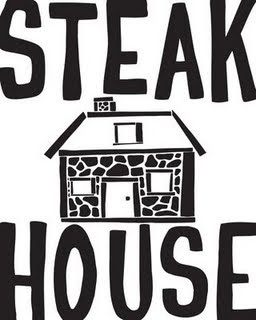 The 2008 Steak House Cabernet was reviewed in greater detail earlier this month. See this post here. Note: The following information was received regarding the Red Diamond wines after this post was published. This information was added on 11/2. 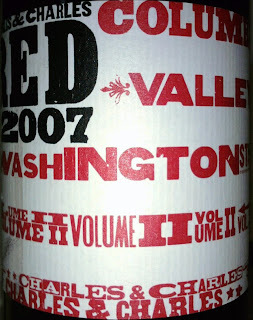 Charles & Charles Cabernet Syrah Vol. II Columbia Valley 2007 A fruity, enjoyable nose full of fresh berries, some gamey notes, and light herbal qualities. Wild, gamey flavors and a citrus component. Syrah seems to beat up the Cabernet at the moment. A real bite on the mid-palate is a serious distraction. Improved a bit on the second day. 50% Cabernet Sauvignon; 50% Syrah. 14.5% alcohol. Red Diamond Cabernet Washington State 2007 Light in color. A muted nose initially with black licorice, black cherry, and candied fruit. As the wine opens berry aromas appear. Lots of smooth oak tastes along with cherries, chocolate, and occasionally some herbs. Simple but enjoyable. Taste more appealing on this wine compared to the Merlot. 13.5% alcohol. Red Diamond Merlot Washington State 2007 Light in color. Toasted notes along with oak, milk chocolate and black cherries on a fun, engaging nose that seems to show some Syrah. Coats the palate with sweet oak along with cherries, and chocolate on a round, full taste. An inexpensive, easy drinker. Nose more appealing on this wine compared to the Cabernet. Strangely, on the second day this wine had a distinct sweet aspect to the taste. 13.5% alcohol. Columbia Crest Two Vines Sauvignon Blanc Washington State 2007 Lime, spice, and an almost buttery quality on the nose. A bit of weight to the palate with an uptick of sweetness followed by a burst of acidity. A somewhat watery feel toward the finish. A very appealing nose but palate has some problems. Still, a lot of wine for the money. 13.5% alcohol. Purchased for $6.65 at Safeway. Magnificent Wine Co. Steak House Columbia Valley 2008 Nose initially shows green pepper along with a lot of bright fruit (predominantly blueberries) and light floral notes. Palate is absolutely not what I was expecting with a light, fruity taste that doesn’t display much oak or tannins and has low alcohol. 100% Cabernet. 13% alcohol.